American Wolf: Lou Reed, Vocalist: An Appreciation. If you were to chart rock and roll singing with Elvis (ideal, majestic) at one end and Johnny Rotten (depraved, sinister) at the other, Lou Reed would land right in the middle at sea-level—neither good nor bad, but rather the point on the zero axis at which things went from positive to negative. It is a pause, a blank, a nothing. While Reed isn't himself a punk singer in the broken, nihilistic sense, he sets the stage for it, sends it on its course. He is the vocal equivalent of the first circle of Dante's hell, where Dante meets Virgil; a sort of gray underworld where everyone who lived before the time of Christ inhabit because they never knew the light of hope. Unlike Dante's other circles, it wasn't filled with suffering and agony because none of the people necessarily knew they were in hell, it was more like they were living in a black-and-white world, unaware that a color one was even possible. Bob Dylan set the stage for such a style by bringing Woody Guthrie's dry, earnest realism to modern folk and then rock and roll, but at the end of the day, Dylan had a beautiful, expressive voice—a chameleon-like array of disguises that belied his young age with first a world-weariness ("A Hard Rain's A-Gonna Fall"), and then a bemused detachment ("Like a Rolling Stone"), before settling into a strange croon ("Lay Lady Lay") by the decade's close. For, at the end of the day, Dylan was ultimately still a singer. Lou Reed was closer to a talker. He upped Dylan's ante by taking the deadpan and using it almost aggressively in the ultimate street-hustler's cool, a lie that believes itself. Vicious. You hit me with a flower. Such a pose worked because Reed's lyrics were often as deadpan as his vocals—deceptively simple things that added up to a sum far greater than its parts. Some have compared it to Hemingway, but I suspect that's more to highlight the hidden romanticism in modernism. T.S. Eliot might be a truer comparison—Lou Reed could indeed show you fear in a handful of dust. It was the odd, precise details that made Reed's best songs cut like razorblades—the street names and the number of flights up to reach the dealer in "I'm Waiting For My Man," the Thursday's rags and blackened shroud worn at "All Tomorrow's Parties," the way the junkie's neck veins feel from "Heroin," the wine in the morning of "I'm Beginning To See The Light," the sangria in the park of "Perfect Day"—they felt more like roadmaps that you too could follow as opposed to the evocative, if bleak, poetry they truly were. Who else could start a love song with the words "Sometimes I feel so happy / Sometimes I feel so sad" and pull it off? The same person who can then sing "She said, 'money is like us in time / It lies but can't stand up / Down for you is up'," three verses later with the same plain sense of conviction—or lack thereof (see: "Pale Blue Eyes"). Throw in the array of characters who walked in, out, and through the songs in a manner that today feels pitched between Springsteen and Faulkner—Sweet Jane, Sister Ray, Candy, Lisa, Stephanie, Little Joe, Jackie, Daisy Mae and Biff, Harry, the Countess of Hong Kong, and Jenny, whose life was saved by rock and roll—and you have an endless sprawl of people who litter the music like the shards of a broken mirror smashed upon the street. The one-two punch of Reed's flat vocals and exacting lyrics resulted in a sound that demanded to be taken completely literally; in fact, Lou Reed may just be rock and roll's first and greatest realist. Vocally, his only competition is Leonard Cohen (who Reed beat by two years) and lyrically his only competition is Iggy Pop (whose career is nearly unthinkable without the Velvet Underground). More than anyone else, Reed's songs seemed to grab you by the collar and look you in the eye. They felt real. It would take the explosion (and implosion) of punk and its aftermath to push this style over the edge, as postmodernists like Joey Ramone turned up the irony, Patti Smith turned up the poetry, and Johnny Rotten turned up the anarchy. But Reed's deadpan style was the formula with which all of these were possible; he was the water that you had to add. But for Reed, whose most influential period came out of a desire to write simple two-chord songs that anyone could figure out after hearing once, perhaps this was the plan all along. 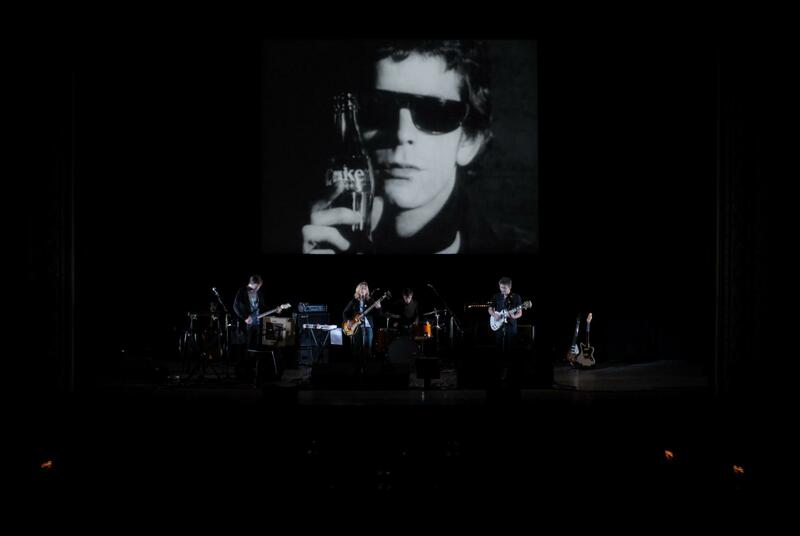 "Andy Warhol told me that we were doing the same thing with music he was doing with painting and movies and writing—i.e., not kidding around," Reed once explained about the Velvet Underground's initial partnership with Andy Warhol. "To my mind nobody in music was doing anything that even approximated the real thing, with the exception of us. We were doing a specific thing that was very, very real. It wasn't slick or a lie in any conceivable way, which was the only way we could work with him. Because the very first thing I liked about Andy was that he was very real." For Warhol, it may have come down to beauty. "The more you look at the same exact thing," Warhol once said, "the more the meaning goes away, and the better and emptier you feel." But Reed seemed to come at it from the opposite side—he took the blankness and found meaning, no matter how dry, strange, or harsh it seemed. One of the first anthems of the New York City punk scene the Velvet Underground helped to midwife was Richard Hell's "Blank Generation." Although many have interpreted the song as a celebration of nihilism, Hell always disagreed. For him, blank was just that—a blank—something that could be filled in with anything. In other words, it was freedom. This is what Reed seemed to be suggesting with his voice. Being at zero isn't the absence of everything, it's the possibility of anything. Thus, even though Reed's styles have ranged over the years from rock to punk to glam to pop to doo-wop to heavy metal, he always sounds like Lou Reed. In doing so, he forces blankness to stare back at itself until it becomes something else entirely—art.